James Joslin tells us about his new piece Hatta, for toy piano, chess set & tea set, sending us back to Alice’s nonsensical wonder-world. 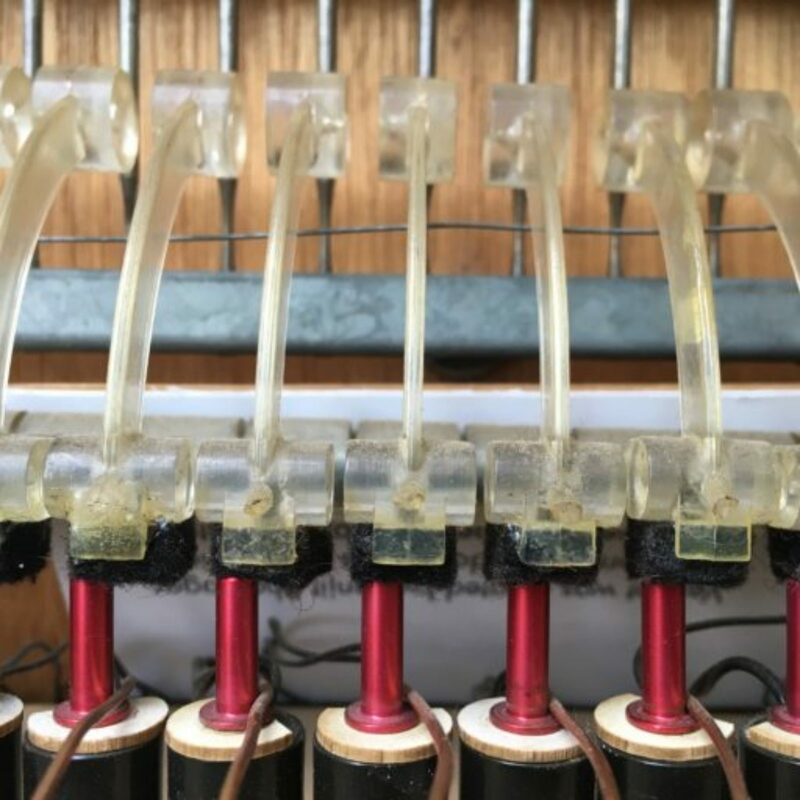 This year’s UnCaged call was for toy piano and unconventional instrument, which left me wondering: Whatconstitutes an unconventional instrument? After much thinking, I decided that ‘unconventional’ means something that can make sound but isn’t considered an instrument at all! I’ve wanted to write a piece involving a teapot since hearing Alvin Lucier’s Nothing is Real, whereby a pianist records a melody and then plays it back through a speaker hidden inside a teapot. The visual result of havinga pianist playing next to a teapot struck me as surreal and absurd in such an effortless way that I knew Iwanted to create a similar atmosphere in one of my own compositions and this call provided me with the opportunity to do so. Hatta, for toy piano, tea set and amplified chess board, is a piece influenced by the tea party that takes place in Alice’s Adventures in Wonderland. Lewis Carroll’s creation has influenced many artists and I feel that its illogical and childlike nature (which also hides some more grown up themes) is a perfect match for the characteristics of the toy piano. The Hatter (along with the March Hare and Dormouse) is forever stuck at 6 o’clock for murdering Time and I felt this musical reference needed to be a main focus in the piece. One of the performer’s tasks is to make a cup of tea and as the kettle is in the process of boiling they become stuck in time as a 4 bar motif is repeated over and over until the water has finished boiling. The musical line is not particularly extravagant, if anything it is monotonous, as if despairing that it will be stuck in this loop forever; forever at 6 o’clock. As if despairing at the madness of the March Hare and as if creating a hypnotic line that could tempt the Dormouse back into slumber. A mechanical alarm clock ticks away in the background, caging the performance as the toy pianist is forced to abide by its metronomic presence. The solo performer is also instructed to play a game of chess which represents Alice’s movements through Wonderland as detailed in Through the Looking Glass. The chess board is amplified so that the sonic details of the moving pieces are audible to the audience and also passes through a reverb unit to create a detachment from the real (sane) world outside of the rabbit hole. The performer has to move both black and white chessmen meaning that they must frequently swap sides of the board and so mimic the tea party’s insane, constant changing of seats as enforced by the Hatter. And so Hatta presents a bizarre and manic sound world juxtaposed with the calm and the rational; a bizarre visual piece of theatre contrasted with a… well, just bizarre actually. The two worlds of Wonderland and reality tug and pull the audience in both directions, but which is which? I’m not sure. And why is a raven like a writing-desk? I haven’t the slightest idea!